Luton missed out on the League Two play-offs, despite comfortably beating promotion-chasing Stevenage. The Hatters needed an eight-goal swing to make the play-offs, but Plymouth's 2-0 victory over Shrewsbury put an end to their promotion hopes. Mark Cullen put Luton ahead, tapping in after Boro goalkeeper Charlie Day saved Elliot Lee's low strike. The home side sealed victory on the stroke of half-time thanks to Michael Harriman's blistering half-volley. 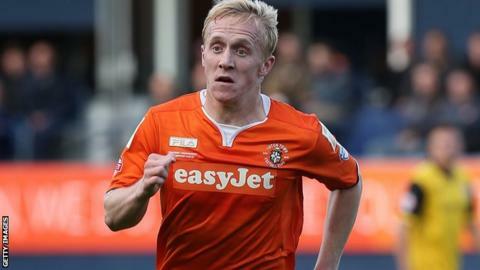 Luton looked certain for at least a play-off position earlier in the campaign, but a torrid end to the season saw them win just three of their last 13 games to finish in eighth place. Meanwhile Stevenage confirmed their play-off place last weekend with a victory over Carlisle and end the season in sixth place. Graham Westley's side will face Southend in the League Two play-offs. Goalkeeper Dave Beasant, 56, best known for captaining Wimbledon to FA Cup glory in 1988, was named on the Stevenage bench for the second time this season. "We played very well today, we won comfortably so I can't ask any more than that." "I'm very proud of what we've achieved with how things have worked out. To finish eighth is a remarkable achievement for us." "I'm quite happy that the season is now at an end and Monday I'm back at work." "It was always going to be a difficult afternoon in the sense that we were sixth whatever happened. "I felt that the players who had a lot more to gain were the right lads to wear the shirt today. "In the end a couple of moments of disorganisation cost us, but we finished strong. "I never worry about injuries because they're part and parcel of football and you have to play the game with the players available. "Southend [Stevenage's play-off opponents] are a very good side and they'll be a very tough nut to crack." Match ends, Luton Town 2, Stevenage 0. Second Half ends, Luton Town 2, Stevenage 0. Corner, Stevenage. Conceded by Ryan Hall. Foul by Ryan Hall (Luton Town). Dave Martin (Stevenage) wins a free kick in the attacking half. Attempt missed. Charlie Lee (Stevenage) header from the centre of the box is high and wide to the left. Corner, Stevenage. Conceded by Luke Wilkinson. Attempt saved. Calvin Zola (Stevenage) right footed shot from outside the box is saved in the bottom right corner. Jake Howells (Luton Town) wins a free kick in the defensive half. Substitution, Luton Town. Lewis Kinsella replaces Scott Griffiths. Substitution, Stevenage. Calvin Zola replaces Roarie Deacon. Substitution, Luton Town. Luke Guttridge replaces Jake Howells. Corner, Stevenage. Conceded by Scott Griffiths. Substitution, Luton Town. Ryan Hall replaces Nathan Doyle. Attempt saved. Bruno Andrade (Stevenage) left footed shot from outside the box is saved in the top centre of the goal. Attempt missed. Michael Harriman (Luton Town) right footed shot from the right side of the box misses to the left. Attempt missed. Jonathan Smith (Luton Town) right footed shot from outside the box is too high. Attempt blocked. Steve McNulty (Luton Town) header from the centre of the box is blocked. Corner, Luton Town. Conceded by Jon Ashton. Attempt missed. Mark Cullen (Luton Town) left footed shot from the left side of the box misses to the right. Corner, Luton Town. Conceded by Roarie Deacon. Attempt blocked. Mark Cullen (Luton Town) header from the centre of the box is blocked. Corner, Luton Town. Conceded by Chris Day. Attempt missed. Jake Howells (Luton Town) left footed shot from outside the box is too high. Michael Harriman (Luton Town) wins a free kick in the defensive half. Foul by Dave Martin (Stevenage). Substitution, Stevenage. Ben Kennedy replaces Ronnie Henry. Substitution, Stevenage. David McAllister replaces Harry Worley. Roarie Deacon (Stevenage) wins a free kick in the defensive half. Second Half begins Luton Town 2, Stevenage 0. First Half ends, Luton Town 2, Stevenage 0. Goal! Luton Town 2, Stevenage 0. Michael Harriman (Luton Town) left footed shot from the centre of the box to the top left corner. Attempt saved. Jake Howells (Luton Town) right footed shot from the centre of the box is saved in the top right corner.